Waning sun illuminates lichen-clad boughs on the shore of Pratt Lake. September 26, 2009. The trail to Pratt Lake climbs gradually through pleasant, evergreen woodland, crossing several noisy creeks before dropping sharply into the stony, amphitheater-like basin from which the lake slips into the Pratt River Valley below. Here and there, bird’s-eye views open to surrounding peaks and hollows. The trail eventually loses the distant rush of Interstate 90 as it arcs northward and deeper into wilderness, as well as the majority of other hikers who turn upward to the popular summit of Granite Mountain after the first mile/1.60 km. During the brief alpine spring, a panoply of wildflowers populates the trailside, culminating in drifts that sweetly scent the air beside the lake. In late spring and early summer, listen for the enchanting, piccolo-like calls of hermit thrushes (Catharus guttatus) echoing along the trail and throughout the lake basin, punctuated by the mournful cries of varied thrushes (Ixoreus naevius), particularly in the evening as other birds fall silent. The Pratt Lake Trail begins at the base of Granite Mountain in dense, mostly coniferous forest accented by a leafy, deciduous understory. Pratt Lake Trail, July 14, 2012. Shortly before the trail’s junction with the trail to Granite Mountain’s summit, it skirts the mountain’s avalanche chute, the treeless, debris-strewn swath of which is testament to the destructive power of a mountaintop of snow funneling down a narrow ravine. The trail is sometimes obscured by debris from the previous winter’s ravages, but it does not cross the chute; rather, it switchbacks sharply left shortly after entering the chute. Pratt Lake Trail, July 14, 2012. 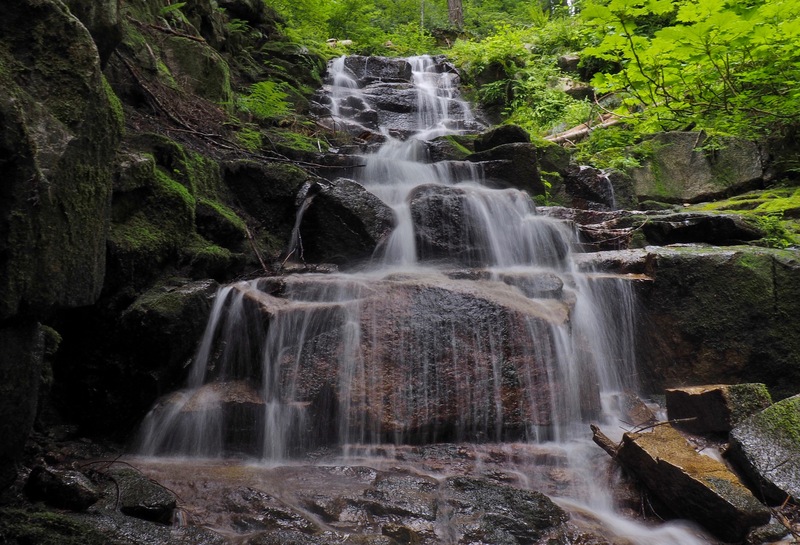 Several small streams patter across the trail throughout the year, often just downstream from charming waterfalls. However, even in winter they can usually be crossed dry-shod by skipping across the stones scattered through their midst. Pratt Lake Trail, June 12, 2016. The subtly varying habitats throughout the trailside’s distance host an array of small spring and summer wildflowers, including daffodil-like sprays of Cascade Oregon-grape (Berberis nervosa a.k.a. Mahonia nervosa) (top left), queen’s cups (Clintonia uniflora) (center left), various decidedly non-violet species of violet (Viola sp.) (center), wood roses (Rosa gymnocarpa) (lower left), white marsh marigolds (Caltha leptosepala) (lower center), and common self-heal (Prunella vulgaris) (right). Pratt Lake Trail, June 05 and 12, 2016 and May 28, 2017. The trail’s woodland wildflower display continues with Pacific trilliums (Trillium ovatum) (top left), Sitka valerians (Valeriana sitchensis) (top right), Columbia lilies (Lilium columbianum) (lower left), common beargrass (Xerophyllum tenax) (lower center), and lupines (Lupinus sp.) (lower right). Pratt Lake Trail, June 05 and 12, 2016. The Pratt Lake Trail offers opportunity to spot a number of Pacific Northwest orchid species. Although much smaller than those of their tropical cousins, the blooms of these native species nevertheless display classic orchid form. In early spring, the tiny heartleaf twayblade (Neottia cordata) (top left) is one of the first to bloom. The spotted coralroot (Corallorhiza maculata) (top right) is abundant along the trail’s lower elevations. The western, or, Pacific coralroot (C. mertensiana) (lower left) can be found in the dense forest along the Pratt Lake Saddle and down the lake basin’s slopes. Look for the slender bog orchid (Platanthera stricta) (lower right) amongst the grasses in seeps along the way. Pratt Lake Trail, May 28, 2017 and June 05 and 12, 2016. Throughout the spring, summer, and autumn, curious mushrooms and other fungi add interest to the woodland floor. 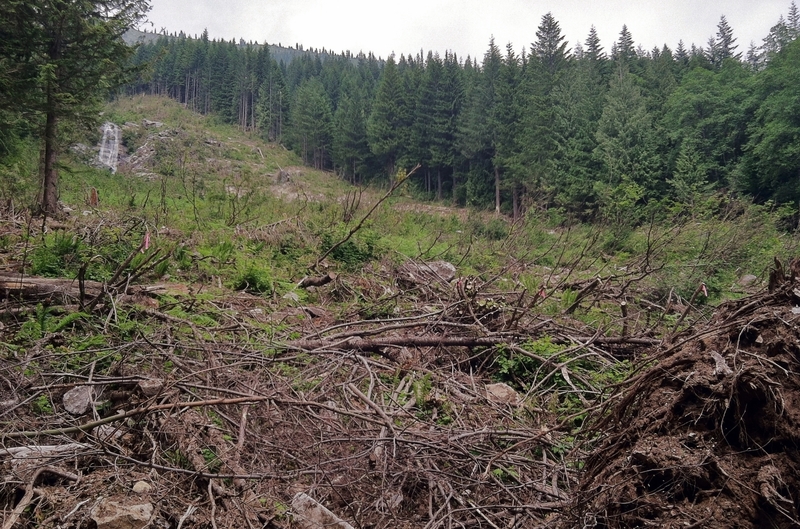 Pratt Lake Trail, May 30, 2016, June 12, 2016, August 10, 2014, and October 05, 2014. As the trail climbs, the mixed forest gives way to conifers, in places so dense it lends the trail a “wood-paneled” appearance. Pratt Lake Trail, July 14, 2012. Shortly before reaching the Pratt Lake Saddle, the forest opens to a glimpse of Olallie Lake and, on a clear day, Mt. Rainier. 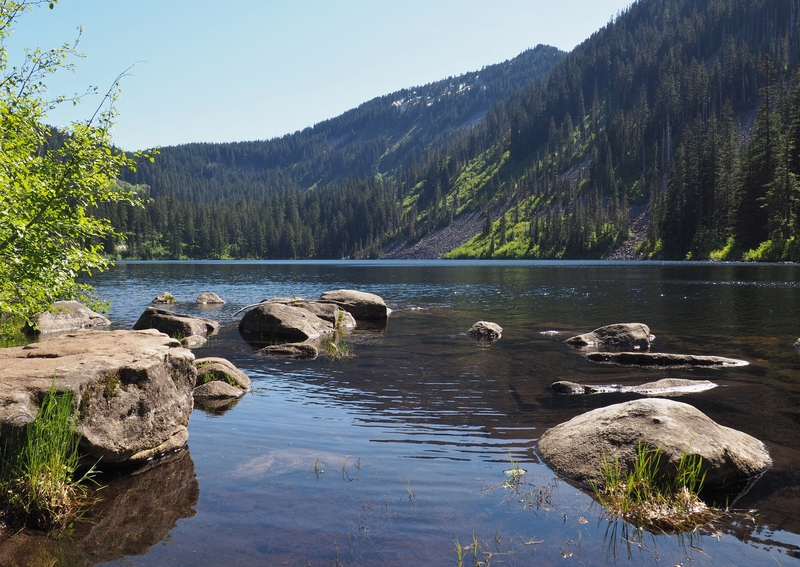 (The viewpoint is sometimes called the Olallie Lake Lookout, although it is nothing other than a short section of trail from which the lake is visible.) At the saddle, the trail branches again, left to Island and Rainbow lakes, and, to the right, steeply down into Pratt Lake’s basin. Pratt Lake Trail, June 05, 2016. 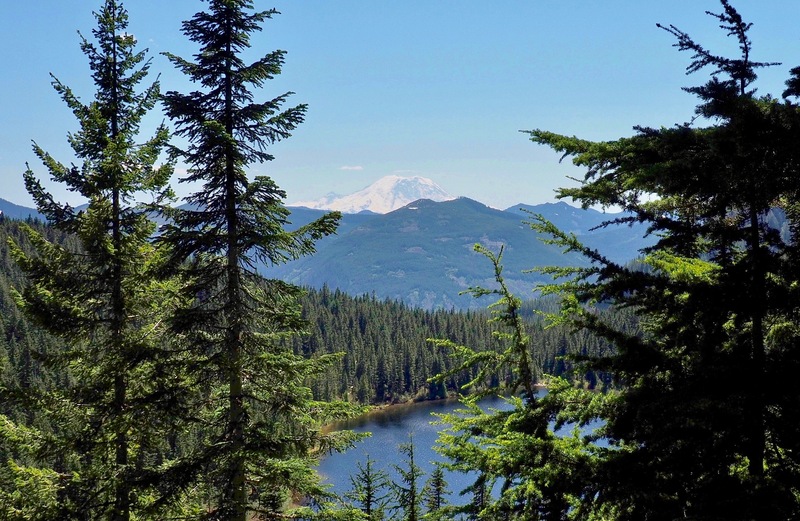 In winter, the Olallie Lake Lookout is a worthy hiking or snowshoeing destination itself, with a round-trip distance of approximately 7.60 miles/12.20 km. Few venture beyond the lookout in winter, as snow deepens considerably along the Pratt Lake saddle and basin. Pratt Lake Trail, February 02, 2014. As the trail drops over the Pratt Lake Saddle and wheels around the talus on the flank of Pratt Mountain, the view opens down the lake basin toward Kaleetan Peak’s distinctive spire. Pratt Lake Trail, June 22, 2013. Throughout the Pratt Lake basin, moisture-loving wildflowers thrive, including Pacific bleeding hearts (Dicentra formosa) (top left), plumed false Solomon’s seals (Maianthemum recemosum) (top right), Sitka columbines (Aquilegia formosa) (lower left), fringecups (Tellima grandiflora) (lower center), and tall bluebells (Mertensia paniculata) (lower right). Pratt Lake Trail, June 12, 2016. Tiniest of all the dogwoods, bunchberries (here, the western bunchberry, Cornus unalaschkensis), appear as sprigs clipped from the tips of their larger, tree-form cousins. Bunchberry blooms typically consist of four white bracts (not petals, but more like colored leaves) surrounding a cluster of tiny, actual flowers in the center, as in the photo on the left. However, a few bunchberries along the Pratt Lake Trail have added several smaller, symmetrically placed bracts that lend their blooms a more star-like appearance, as in the photo on the right. Pratt Lake Trail, June 12, 2016. Pratt Lake pools at the foot of Pratt Mountain before slipping into the Pratt River Valley beyond. Pratt Lake Trail, June, 22, 2013. Late afternoon sunlight scatters gems across quivering waters. Pratt Lake Trail, June 22, 2013. Stones near Pratt Lake’s mouth invite lakeside seating. Pratt Lake Trail, June 05, 2016. From its marshy, log-jammed outlet, Pratt Lake spills into a creek that soon joins the Pratt River. Pratt Lake Trail, June 05, 2016.